Hey guys!! This week I wanted to tell you a little about the AristoCrêpes stand in Disney Springs. This is the first article in a series of Disney Springs Dining favorites of mine so be sure to subscribe below to get these and many more restaurants and shop reviews from Disney Springs! Our first time trying this little eatery was in May 2016 shortly after AristoCrêpes opened. At that time they only served sweet crêpes and meal crêpes, but on our Memorial Day trip to Disney World we found out they also carry what they’re calling “Bubble Waffles”!! Our first time trying AristoCrêpes we had the Ham and Cheese Crêpe. Which is loaded with Smoked Ham with Cheese and a Dijon Spread. It was so good! I’m not sure what kind of cheese it was but it reminded me of the cheese they use on the Ham and Cheese Croque Monsieur at Be Our Guest which I believe is Gruyere Cheese…whatever it is I am in love with it! Disney must love it too because they put it on a lot of goodies!! 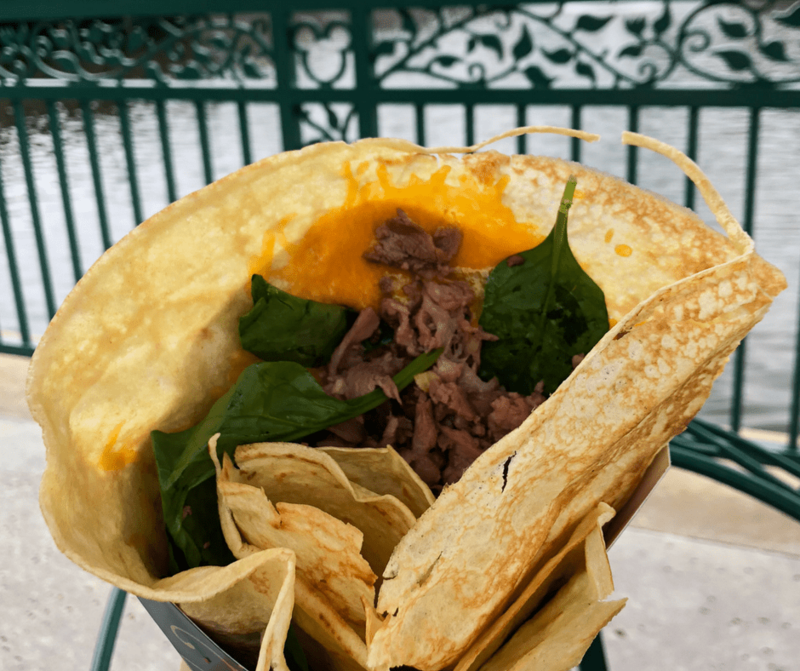 On our Memorial Day trip, we tried the Beef and Cheddar Crêpe. It usually has Beef, Baby Spinach, Sharp Cheddar and Horseradish Cream, but I’m not a fan of horseradish so I got it on the side, and because I loved the Dijon spread from the Ham and Cheese Crêpe so much I got a side of it as well. It was a delicious combination with the Beef and Cheddar as well!! Of course, I did try the horseradish sauce just to see if I would like it…I did not. Both were $8.99 which I think is a great price and we were able to share it. ~ S’mores Crêpe which has Chocolate Sauce, Graham Cracker Crumbs, and Toasted Marshmallow Creme. ~ Strawberries and Cream Crêpe which is Strawberries, a touch of Brandy and Toasted Marshmallow Creme. ~ Banana Chocolate-Hazelnut Crêpe which is Bananas, Salted Caramel, and Chocolate-Hazelnut Spread. I am so bummed out that we didn’t get these, but we chose to go to happy hour at the Smokehouse after lunch instead of getting something so sweet. Now I’m really wishing I would have gotten one!! Oh well, next trip!! ~ A Salted Caramel Bubble Waffle which is Chocolate Ice Cream, Caramel Sauce, Whipped Cream, Pretzel Pieces topped with Crispy Pearls. ~ A Strawberry Bubble Waffle which is fresh Strawberries, Vanilla Ice Cream, Whipped Cream, and Strawberry Pearls. Little pricey for beer and I didn’t like the seasonal offerings of Yuengling and some summer ale, and that’s when we were like…ooooooh beers at Smokehouse!! Happy Hour!! Vivacious Views Inside Tip: Smokehouse has the cheapest happy hour beer at Disney Springs…for the low price of $3.75!! And it’s super cold…like frost on the top cold! The good stuff. We really enjoy sitting at the outdoor tables and taking in the view of the World of Disney Store across the waterfront. so you can see the Volcano erupt!! Have you had one of the Bubble Waffles or Delicious Crêpes? !